Hey, Simmers! Did you know you can now get a family portrait of your household in the Sims 4* by downloading The Sims Mobile? That’s right. We love The Sims Mobile so much, we thought you might like a piece of it in The Sims 4. Plus, you can also get cool stuff in The Sims Mobile — the Unbearably Cute costume and hat, Opulent Armor Statue, and Bob Pancake's Robe. If you already play The Sims Mobile, open the game from the link to claim your rewards. With so many original The Sims 4 families, this means you could get a portrait of cat lady Kathy and her 26 feline friends. Or, what about creative chef Ashley and her five fun roomies? Or, will it be mad scientist Mel alone is his dark lair? We’re just spit-balling here, people. 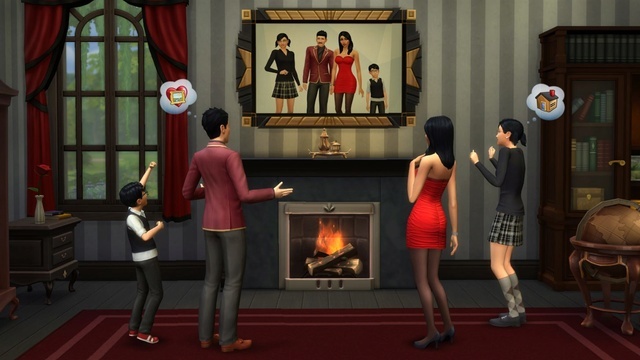 Your Sims’ portrait is personal to your game and it’s a great way to show off a happy (or dramatic!) household. The possibilities are truly endless. Thanks for playing The Sims 4 and we hope you have a blast in The Sims Mobile! *Offer not available in China, Egypt, Germany, Hong Kong [SAR China], Japan, Korea [Democratic People's Republic of], Korea [Republic of], Kuwait, Macao, Oman, Qatar, Russian Federation, Saudi Arabia, Taiwan, Province of China, and United Arab Emirates. Too tiny to play it on my iPhone so put it on the iPad and haven't tried it and probably won't. There are other things I'd rather do. It definitely will take away your time to do other things. And I wholeheartedly agree that it is too tiny to play on my phone. I'm going to stick to the PC.